Making Christmas Cards is something I look forward to every year. When the first Christmas stamp releases start, my Christmas music comes out and I'm ready to start filming my 12 Days of Christmas series. This is the 4th annual 12 Days of Christmas and thank you so much for joining me! The series will run Monday-Saturday until November 4th with comments and giveaway entries due November 6th. 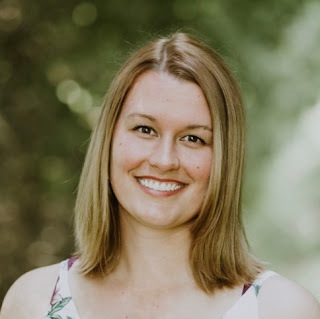 If you're interested in learning more about the 12 Days and how I go about planning and creating, please consider listening to So Suzy Podcast today! Click here to watch this video on YouTube and leave a comment to win prizes! Today is such a special day! 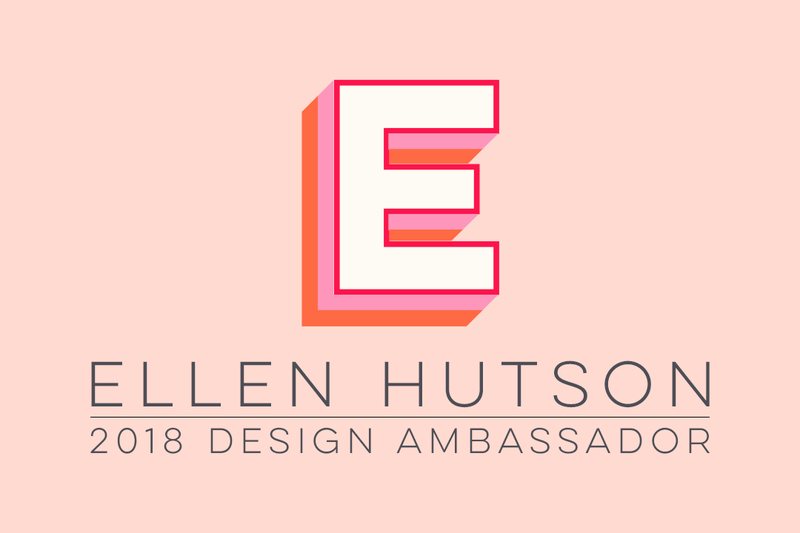 Not only is it the first day of the series but I have invited some of my favourite Crafty YouTubers to help me create a video hop along with our friends at Simon Says Stamp! There are 8 videos to watch and you have until November 6th to leave a comment on each video to be entered into the draw for TEN different prizes! 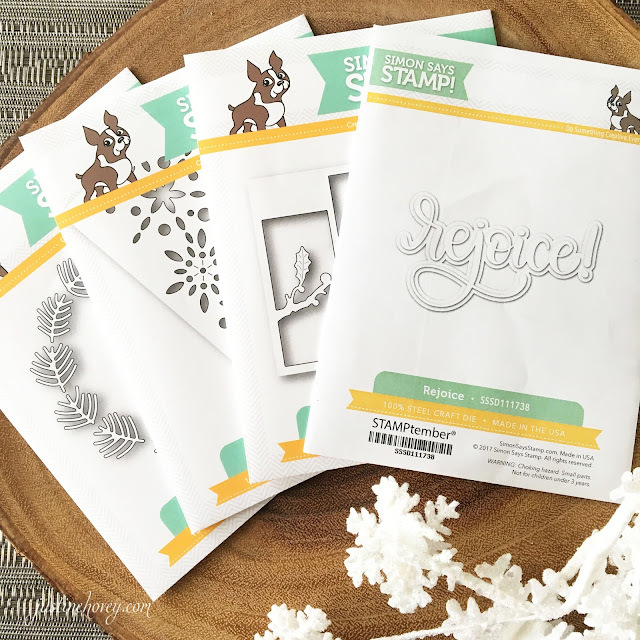 There are 6x $10 gift certificates to Simon Says Stamp 1 Misti Stamping Tool and 3x 10 pack of homemade cards by Justine (me!). I used FOUR intricate and elegant dies to create this set of five cards. The designs truly are spectacular and having that hint of blue on such vibrant white paper is a fantastic combination. I used alcohol inks to create these backgrounds on glossy paper. They are super easy to use and I show you several ways to get a variety of looks by just adding some blending solution, blowing with a straw or simply twisting and turning the paper. The Holly Triptych die is also great for creating horizontal or vertical A2 cards! Can you believe the card on the right was a big mistake? From accidentally gluing down the sentiment in the wrong area to getting ink smudges all over the paper, this mistake just needed to be cut down in order to become a great card! You can also see the Rejoice Die in action including the background die in the set. 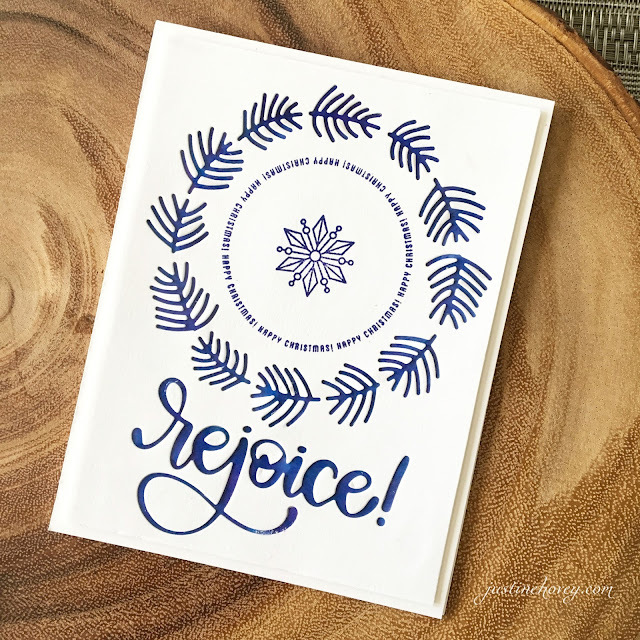 The Holiday Circle Sayings is a perfect stamp set to pair with any circular designs you may be wanting to make this holiday season! I love the intricacy of the wreath die, it's so stunning with all the differently shaped sprigs. This Snowburst Die is truly perfect for both horizontal and vertical cards! Don't forget to watch the video in order to see how I decorated the insides of these cards! As much as a I love simple Merry Christmas sentiments, I also love thoughtful and unique ones as well. 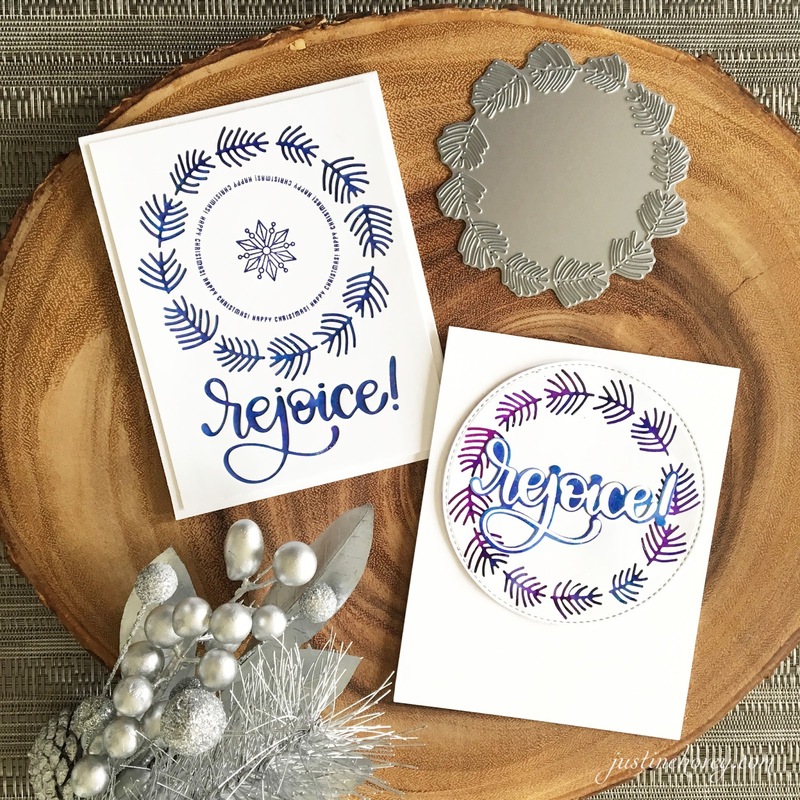 The Altenew set, Holiday Wishes, is perfect for adding sentiments to the front and insides of cards. There are a variety of different lengths and sizes! Check out So Suzy Podcast today! Wow Justine!!! I'm very excited!!! It was amazing last year!!! And I'm really sure that it will be awesome this year too!!! Gorgeous cards, Justine! Thanks so much for a really fun video hop...I'm really looking forward to seeing what else you have in store for us this year! 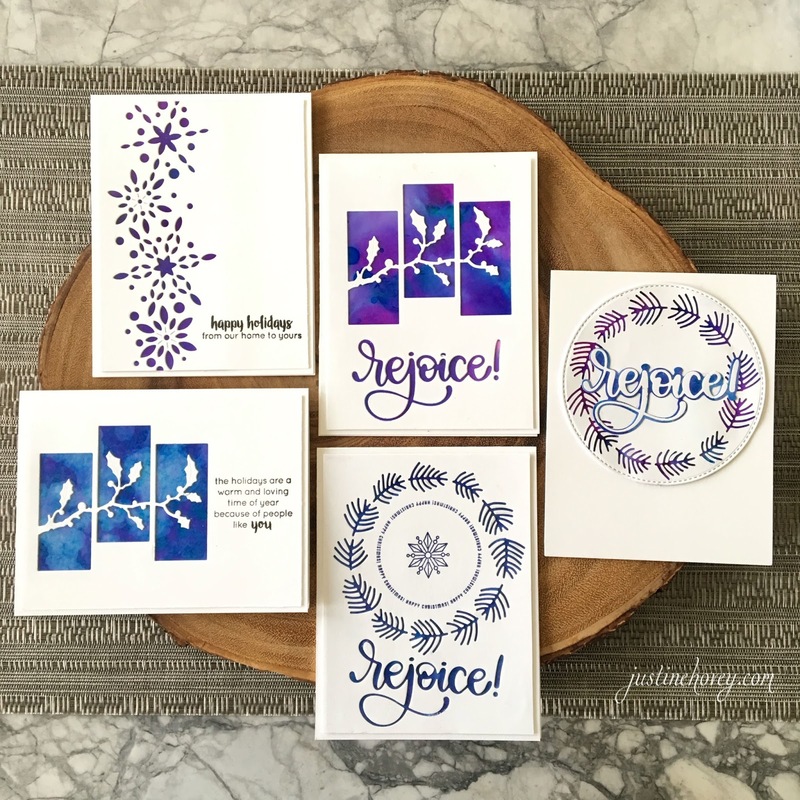 Love blog hops - and your cards are so beautiful. Great inspiration. This is fun...so glad I finally found you. Apparently, I'm late to the game. Anyway, love the alcohol inks and am thrilled that they're experiencing a resurgence of interest. All five of your cards are lovely. Glad I'm not the only one who has brain drain occasionally. Rescuing cards is something I have to do all the time. Love the cards and the video blog hop. Love the inspiration with alcohol inks - gorgeous cards. I am wishing for a Gemini electric die cutting machine. Oh yeah, forgot the question...would love a set of polychromos for Christmas. It's on a note attached to the refrigerator, so hopefully it won't be missed. Beautiful coloring with the alcohol inks!! Looking forward to your 12 Days of Christmas event! Can't wait to go play with my (almost) forgotten alcohol inks! Thanks for the inspiration. My crafty Christmas wish -- a full-sized Misti! love the shades of blue backgrounds on your cards. They are gorgeous. Love the cards, the alcohol ink background looks gorgeous with all the white!! I would love to get a new alphabet stamp and die set this year!! Beautiful cards, LOVE these vibrant alcohol ink backgrounds on white! Amazing blog hop to get inspired, thanks so much! Very pretty cards. My attempt with alcohol inks did not turn out very well for me....maybe time to give it another try. My crafty item on the wish list this year is the Misti stamping tool. Awesome cards ! I've never played with alcool inks.... maybe I'll add some on my Christmas wish list.... Thanks for sharing. I've already an additional Misti on my list. I'm addicted to my Misti and I'd love to get another one. Maybe I'll be lucky enough to win one... I'll keep my fingers crossed ! Justine your cards are beautiful. Very quick to make if you need a lot of cards but eloquent. I really don't have anything crafty on my wish list because My hubby just bout me a new Vagabond and Scan n Cut 2 in August. Maybe I shouldn't ask for something expensive right now! LOL! Justine, loved your video. On my Christmas list this year are supplies for my various crafts. For card making inks & more copic markers. For embroidery various stabilizers & more Isacord Thread colors. Yes, the alcohol inks produce stunning colors. Beautiful cards. I have zig clean color markers on my wishlist. Along with a minc machine, tombow markers; i could list lots more. loved your video. 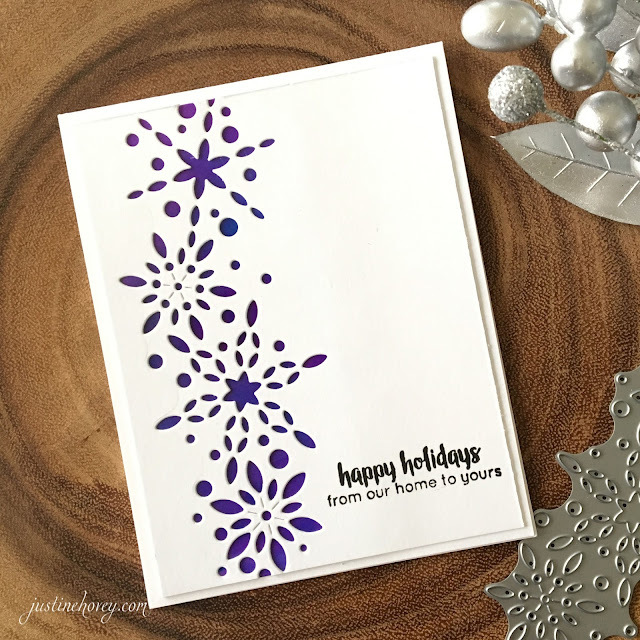 my crafty item on my wish list would the Misty stamping tool. i just think its so useful for multiple projects. Lovely cards, Justine! You've inspired me to revisit my alcohol inks. My wish list of crafty items for Christmas includes a new heat gun. I'm thinking that I'd like one of the Hero Arts Wagner heat tools. When I first started watching this video I wasn't too sure what to think except that you had one hot mess going on! Lol! However, I was curious and kept watching and Oh my gosh what gorgeous cards in your finished product!!! Now, one of my new things on my Christmas wishlist will be a full set of the alcohol inks!!! Love it! Have a blessed day and thanks for helping me expand my card making abilities--can't wait to try this! Beautiful cards! I love the vibrant colors and white space together. Great cards and a great video. I tried doing backgrounds with alcohol ink not too long ago. Trying to figure out why I waited so many years to try it. Thanks for sharing and inspiring us. Thank you for using alcohol inks. I'm breaking mine out again. Your cards are beautiful. I would love to have a craft room organizer to help me get more organized. I don't need another craft item, time to destash. 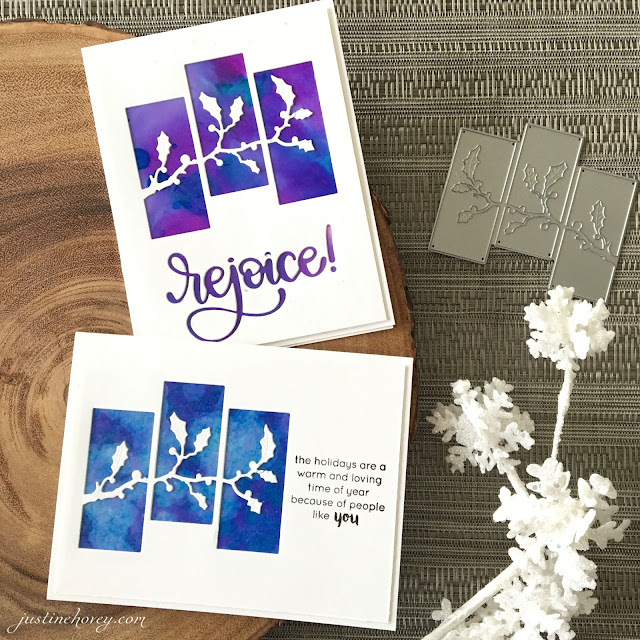 I love all the great inspiration on blog hops & your cards really have me ready for Christmas cards! Thanks!! These cards are beautiful! I love the colors! Hi Justine, I just finished the hop and it was AWESOME! Question: I have been signed up to your blog for sometime but I never get any of your blog posts in my inbox. I just tried to re-subscribe (thinking I may not be but just thought I was) but it says I am already subscribed, which is what I thought. Why is it I never get one? Very excited to join you as you crank out Christmas cards...love learning new techniques from you. Your cards are always fantastic. So many wonderful techniques. Inspiration for everyone. What beautiful cards using the alcohol inks technique. I have to try this (with my gloves). Thanks for sharing. I forgot to mention that on my wish list are cobalt markers, and Lawn Fawn gift certificates. Gorgeous alcohol ink cards. I have the Misti tool which I love, thinking it may be time to get a 2nd stamping tool, perhaps the Tim Holtz one for bigger projects. On my wishlist for this Christmas is the Cricut Maker. I have a Cricut Explore Air but would like the Maker that cuts more materials than the Explore. Enjoyed the wonderful alcohol ink creations. Especially like how you turned an error into something wonderful by using the circle die on the wreath. I've got the Gansai Tambi watercolors on my list, and now I think I'm adding watercolors as well! Love the cards. On my wish list for this Christmas would be Snowburst die set. Justine your cards a gorgeous, really would have to give this a try for making backgrounds. Thank you for sharing. I'd love to win the giveaway prizes! Love these fun dies! Justine, your cards are so pretty and fun! Love the cards and the video hop! Love the colors for these, I never branch out of traditional 'Christmas' colors. These are absolutely beautiful! I love the alcohol ink backgrounds. On my crafty Christmas wish list is an organization fairy! Ha! I need to organize my junk so I can get some of these beautiful new SSS dies. Thanks for sharing you wonderful video(s) with us!! Absolutely beautiful cards! I have a ton of these alcohol inks, but haven't really used them. Thanks for the fabulous inspiration on how to get started with them!! WOW! Your cards are gorgeous! 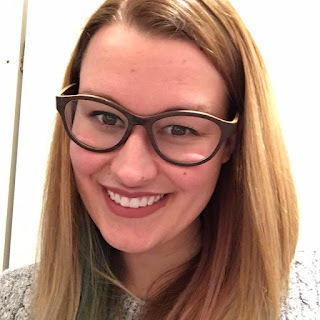 I'm so glad I found your blog and just signed up! Thanks so much for sharing your talent!!! Welcome back alcohol inks! Not that they really went away, but I have neglected mine and with your inspiration, they are all back out on my craft table ready to play! Thank you for sharing! Love working with alcohol inks -messing loveliness! I am asking for a MISTI from my special Santa. Beautiful cards! I really love the snowburst collage die cut, and the circle saying with the snowflake in the middle is really cool. I too am so glad that the alcohol ink is coming back. It makes such a beautiful background on your cards. Thank you so much for sharing your cards with us. I love this technique. So vibrant and beautiful with these new dies. My wish lust includes the Simon Says stitched dies and of course the holly die. Beautiful card! I'll have to get my alcohol inks back out and play!! I'm really wanting a second MISTI for Christmas! OMG! I am so exited about this years 12 days of Christmas! I love snarky Christmas Cards too! Beautiful cards! Of course I'm pinning them! I want to find them again! These cards are absolutely stunning. I love these cards. The colors are great and these cards are elegant. I love the die with the vines. Beautiful artwork! Thank you for the inspiration, I have a die I want to use for my Christmas cards, but it seemed a bit plain. Now I know how I can spice it up! As for what’s on my wishlist, a lot! LOL. I want to fill in colors of my prismacolor pencils. I’m really trying to work 9n my coloring skills with them but fill like I need more colors. I love the look of alcohol inks for the background! Would love to get the large misti for Christmas! Please, Santa, bring me a set of Chameleon double-ended color pencils! Love the pop of color on your white cards! Thanks for sharing. I am in love with these cards! love working with alcohol inks and will definitely try these! ❤️❤️❤️ the blues and purples against the starkness of the white! Absolute perfection! TFS! Congrats on your fourth year! This is my first year watching you. I will have to go back to your previous series!! Gorgeous cards. Love that wreath die. Gorgeous cards! The video hop was fun, and I subscribed to a couple I hadn't seen before. Thanks for your inspiration! I love using alcohol inks. I use both glossy cardstock and Yupo paper. Your cards are beautiful. Pretty cards! I really like the dies you used. I enjoyed your technique video with the alcohol inks and your projects were lovely. Very pretty cards Justine! The snowburst die is definitely on my list. Your podcast interview is fantastic! This is my first time with your 12 Days videos. I know I will be very inspired. I really have not used alcohol inks - so I guess those are added to my holiday wish list as well as a mini MISTI. I love my regular MISTI. Thanks for sharing your incredible creativity! Great cards! Love your colors, so vibrant! I have a stash of glossy card stock and will have to try that! Love blog hops, so many new ideas and tips to try out. Wow! I am new to your site and am quite impressed. Great use of SSS products. I look forward to your videos and this one has wonderful cards! My crafting wish list has all the dies you showed today! I goin to practice this technique. Is't new for me! Love all the similar cards. Thanks for the video! Your alcohol inks made fantastic backgrounds for all the wonderful die cuts. Clean and simple with impact. On my wish list are the Kuretake Gansai Tambi watercolors. This is such a gorgeous set of cards !! You make me want to give alcohol inks a try! I would like some alcohol inks, a laminator, & lots of cardmaking ideas for Christmas. Thank you. These cards are so beautiful and rich, I love their elegance. I love each and every single one! looking forward to the rest of the days!! Loved the video, great Simon Says stamps and alcohol inks. Would love to try them. I really love these backrounds! I have never used alcohol inks myself, but they look like they would be so much fun to use!! 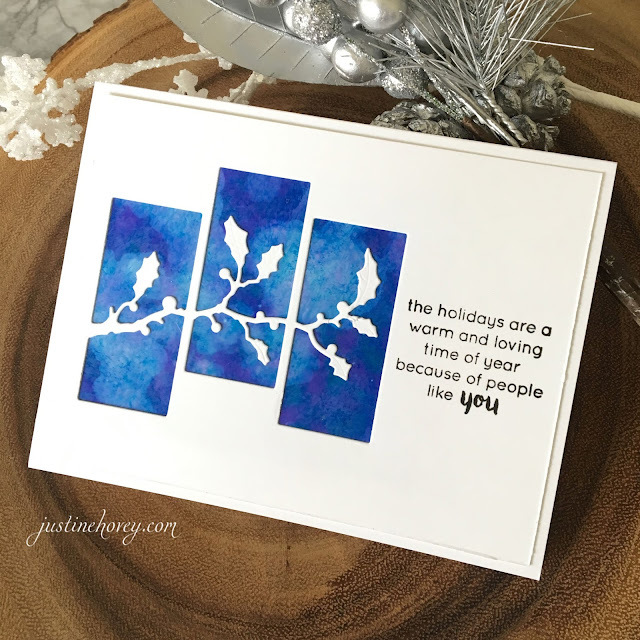 I love the holly three window cards! I love them all, but I think the snowflakes are my favorite! It's now January, and I just found this post. Thank you so much for the wonderful video; your cards are lovely. On to the hop . . .